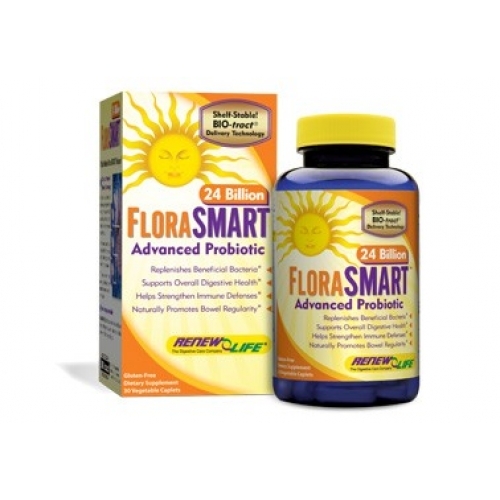 FloraSMART 24 Billion is a daily maintenance probiotic formula that supports digestive health. t is ideal for travelers and people on the go because they do not require refrigeration. It contains 10 strains of microflora, including Bifidobacteria, Lactobacilli and Lactococcus cultures to support intestinal and immune health. When using probiotics, it's important to choose a probiotic supplement that supports both sections of the intestinal tract. Each FloraSMART caplet also uses a unique BIO-tract™ delivery system to safely and effectively deliver probiotics to the intestines. The BIO-tract™ delivery system consists of natural plant-based compounds that form a gel around each caplet when it is exposed to liquids. The gel coating allows the caplet to bypass the harsh acidity of the stomach and deliver the probiotics directly to the intestines. Each caplet breaks down over a 10-hour period, offering a true controlled release of the probiotics.